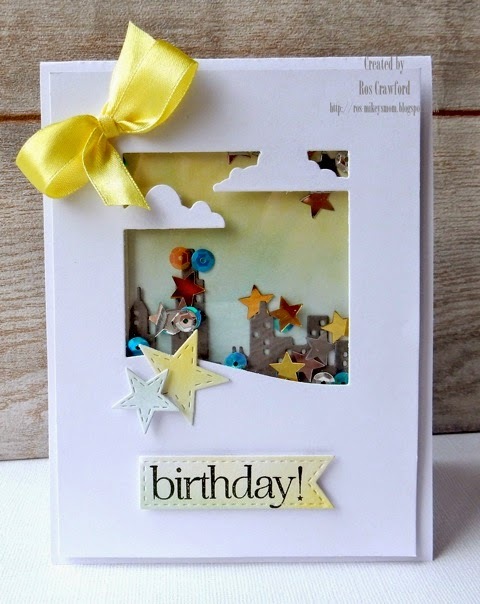 I am happy to be guesting at the City Crafter Challenge Blog where this week we are casing a card from one of the City Crafter Design Team. This week it's the talented Ros. You can find the card we are casing at the bottom of this post. I think it will be easy to see how this card was inspired by Ros' card. I created a shaker card as inspired by Ros. I used Hero Arts Row of Houses to create the scene inside. I die-cut some flat bottom clouds and placed them on the front face of the card. I wrapped some aqua baker's twine around several times finishing off in a bow. A sentiment was added from Paper Smooches with a finishing touch of some enamel dots. Here is Ros' darling card. I hope you can join me this week. Please stop by the City Crafter Blog to see the other talented ladies and their take on Ros' card. Thank you for coming by to visit and I would like to say a special thank you if you leave a comment. How sweet is that, I love those lovely colors you used, thanks for being our guest this week at CCCB, it was an honor having you. Oh my this is a brilliant CASE of my card!! I love your little scene! I'm so glad that you are guesting here on at CCCB my week! Have a lovely day! Congrats on the GDT!! I loveeeee your card! LOVING the colors and the clouds!!!!! Your shaker is beautiful!The colors are so bright and love the twine..cute combo! Congrats on your GD spot! A beautiful shaker card with the colorful houses! Great touch with the clouds and twine! And, congrats on being guest designer! Such a pretty card, love that sweet scene and the shaker design! The colors look awesome with the white base! Congrats on your guest designer spot! Oh Tammy this is outstanding!!! I love the way you CASED Ros's wonderful card. Really REALLY cute!! Sorry you had a bad start to your day, hope it got better. Sending a big hug! I love your case of Ros's darling card! Great choice to use the HA houses, Tammy, & I love the twine! OMGosh, this is fabulous, Tammy!! I LOVE your take on Ros's adorable card! Your bright and colorful city houses are fabulous! Love the bright mix of sequins and candy dots, too! Fabulous Tammy!! Every little detail is fabulous!!! Congrats on your GDT spot. What a cute and fun shaker card. I love the pinks and blues. lovely colorful city scene and shaker! Super cute, girl! Love all the bold, bright, happy color amidst your little scene! So fun!